Ever since Bushway Packing slaughterhouse was shut down for alleged animal cruelty last October, Vermont officials have maintained they had no knowledge of calf abuse while it was happening. Diane Bothfeld, the state’s deputy secretary of agriculture, told the Burlington Free Press in November the state was unaware of prior violations at the Grand Isle slaughter plant until the Humane Society released an undercover video in October showing plant workers abusing newborn veal calves. As recently as February 4, the state’s chief meat inspector, Randy Quenneville, testified at the Statehouse that, had the cruelty been reported to Vermont officials sooner, the state could have moved in to investigate. Now it looks as if Quenneville and a colleague did know. 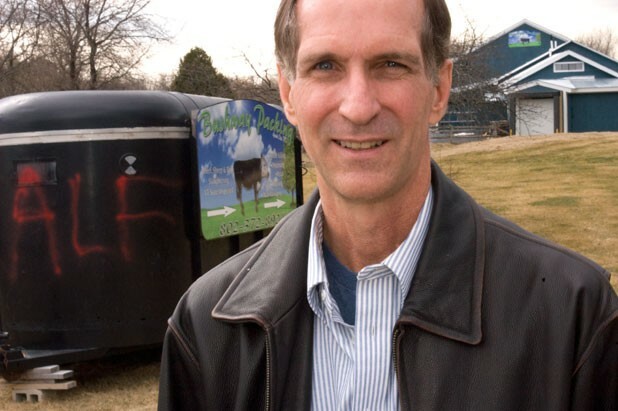 Emails and memos provided by a federal veterinarian-turned-whistleblower appear to show that Quenneville and state food safety specialist Terry McKenna were informed at least twice of abuses that led the plant to be suspended for violating humane slaughtering laws. The information provided by Dr. Dean Wyatt, a Vermont-based supervisory public health veterinarian for the USDA, contradicts what state agriculture officials have said in media reports, and raises questions about whether they missed signs of repeated abuse or misrepresented to lawmakers what they knew and when. It’s unclear whether the state could have legally moved in to close Bushway. Kelly Loftus, an Agency of Agriculture spokeswoman, maintains the state had no jurisdiction over the plant because it was a federally inspected facility. (Plants that ship meat out of state are regulated by the USDA.) The video confirmed the federal inspector assigned to the plant did nothing to stop the abuse. The man who held that job has since been fired. But the state does grant Bushway a “retail license” to sell veal in Vermont. Loftus couldn’t answer whether the retail license gave Vermont the power to shutter the plant for repeated unsafe handling. Carl Cushing, who was Vermont’s chief meat inspector from 2001 to 2007, says it is possible, though uncommon, for the state to close a plant by yanking its license. It would take convincing evidence of serious abuse, Cushing notes, and would probably require hearings in Montpelier to allow plant owners to challenge the closure. Quenneville, in his testimony on February 4, seems to suggest that the state, at the very least, could have investigated. “Even though it is a federal plant, if any of those issues had been reported to the Vermont Agency of Agriculture, there is authority through the animal health rules and with meat inspection that we could have gone and checked that out anyway,” Quenneville said. Each time, Wyatt says he alerted McKenna, the state inspector in charge at the plant, of what happened. Wyatt also reported the violations in memos emailed to McKenna, Quenneville and USDA officials. He provided Seven Days emails sent to the state inspectors with copies of two such memos attached. The third memo is trapped in a broken government-issued computer, Wyatt says, and could not be retrieved. The three suspensions ordered by Wyatt were for dragging and throwing downed calves — violations similar to those that shut the plant down once the video surfaced. Calves brought to Bushway are often so young they are unable to stand on their own. Federal law prevents plants from slaughtering livestock that are unable to walk. On May 12, the plant was temporarily suspended for dragging “downer” calves across a holding pen — a violation of humane slaughter laws. On June 24, Wyatt reported seeing a worker who was unloading calves from a truck yell, “Get up, you fucker!” at a downed calf, before picking the animal up and throwing it off the second tier of the truck trailer “like a football,” Wyatt says. The creature landed on its head. And on July 1, Wyatt observed a worker grab two downed calves by the hind legs and drag them down a loading ramp from the truck. Each time, the plant was suspended for one day and owners filed a corrective action plan with the USDA that allowed Bushway to reopen. Wyatt says he emailed a “Memorandum of Interview” detailing the violations to USDA and Vermont officials after each occurrence. Emails provided to Seven Days, dated June 24 and July 1, appear to support that claim. Loftus acknowledges that state officials had “anecdotal” information about the ongoing animal cruelty at Bushway but suggests the matter was out of their hands. “Yes, we did know that there were issues with that particular plant, but to the extent and what they were was not made clear to us until the video was brought to our attention,” Loftus says. “It was our agency’s assumption that USDA was following up on their inspector’s report,” Loftus says. Loftus wouldn’t comment on Wyatt’s assertions about state agricultural officials having specific prior knowledge of the abuse, and she declined Seven Days’ offer to provide Wyatt’s memos and emails for the state’s review and verification. “I’m not concerned about that at this point,” Loftus says. Sen. Harold Giard (D-Addison), vice chairman of the Senate Committe on Agriculture, is highly critical of the state’s response to the Bushway ordeal, calling it “a tremendous embarrassment” for the Vermont Agency of Agriculture. Giard says he requested documents from the agency about the three suspensions at Bushway but has yet to receive them. Does he have reason to believe ag agency staff misled his committee? Giard says he’ll withhold judgment until his own records request is filled. Wyatt’s assertion about Vermont meat inspectors is the latest chapter in a saga that has made him something of a hero to animal rights activists. The son of a federal meat inspector who died in the line of duty, Wyatt came to Vermont by way of a hog slaughtering plant in Oklahoma, where he exposed repeated violations of humane slaughtering laws. Numerous times, Wyatt suspended operations at Seaboard Farms after observing workers slaughtering pigs that were still kicking and blinking — a breach of federal law — only to be overruled by USDA supervisors and see the plant reopen. Wyatt’s first impression of Bushway was largely positive, he says. The facilities were “clean” and “impressive,” he says. The number of calves that tested positive for prohibited antibiotics, for instance, far exceeded the slaughterhouse standard, Wyatt says. Animals aren’t supposed to have drugs in them when they come to slaughter. The Bushway story was a major impetus for a recent federal investigation of slaughterhouse problems conducted by the U.S. Government Accountability Office. Wyatt cooperated with the probe, recounting in a congressional hearing the widespread violations he and GAO investigators found in Vermont and elsewhere. Wyatt hasn’t been inside Bushway since the USDA and State of Vermont shut it down in November, but he may find himself back there shortly. Plant owners have reportedly struck a deal with the USDA that will allow Bushway to reopen soon. Quenneville defends his handling of the situation by saying that the Agency of Agriculture had no reason to believe there was inhumane handling at the plant beyond what had already been reported to USDA officials, and there were no signs the USDA system for addressing such problems was not working as it should. "As soon as the Vermont Agency of Agriculture was notified of alleged further inhumane treatment of animals were ongoing and not being addressed by USDA through a video submitted by HSUS, the agency took immediate action to suspend slaughter and processing at the establishment," Quenneville said in a written statement emailed to Seven Days on Wednesday, after the story went to press. Quenneville says the state retail license issued to Bushway would generally not be associated with humane handling events, but notes "a retail license can be be revoked or suspended as well." Quenneville maintains his comments to the Senate Committee on Agriculture were taken out of context. When he told the committee, "The fact that they waited three months to say anything really escalated that into an out of control situation," Quenneville says he was referring to the Humane Society of the United States, not USDA inspectors. The Humane Society worker who caught the mistreatment on video tape wasn't at Bushway for three months; he was there for 21 days, spread out over a seven week period, according to Mary Beth Sweetland, the Humane Society's director of investigations. The Agency of Agriculture's Kristin Haas suggests Quenneville's "three months" remark might have been referring to the period - from August 17 to October 30 - between the start of the Humane Society's investigation and the release of the undercover video.